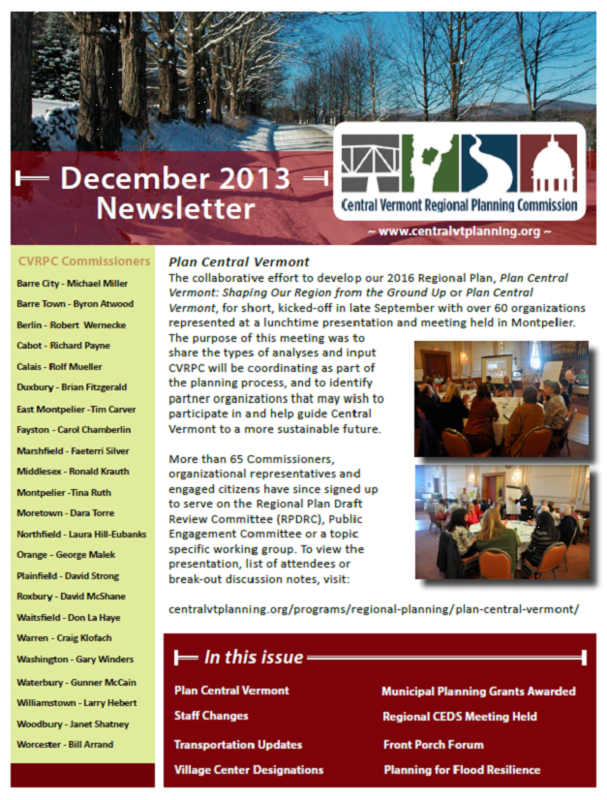 Our latest newsletter is ready and can can be downloaded from http://centralvtplanning.org/news/newsletters/ or by clicking on the image at left. On January 6th, Kari Dolan, Ecosystem Restoration Program Manager would like to meet with Central Vermont municipal – town managers and public works staff. The purpose of the meeting is to discuss the Lake Champlain restoration plan (i.e., the Total Maximum Daily Load or TMDL). She is specifically interested in discussing the draft Proposal for a Clean Lake Champlain that pertain to road and stormwater runoff. (Please see the attached document and information on our website: http://www.watershedmanagement.vt.gov/erp/champlain/). This is a priority of the State of Vermont, and will have an effect on how municipalities manage roads and stormwater. The proposal is in draft form. The State Department of Environmental Conservation (DEC) would like to hear your comments on how the State can best work with municipalities to reduce stormwater runoff and erosion. Date Jan. 6 (Monday) 2-4 pm, at the Central Vermont Chamber of Commerce lower level Meeting Room (at the intersection of Paine Turnpike & Stewart Rd) Berlin. FY 2014 Municipal Planning Grant awards have been announced and three Central Vermont municipalities will be recipients. The Municipal Planning Grant (MPG) program encourages and supports planning and revitalization for local municipalities in Vermont. Awarded annually and administered by the Department of Housing and Community Development, the MPG program works to strengthen Vermont by funding local planning initiatives that support statewide planning goals. Congratulations to the City of Barre and the Towns of East Montpelier and Waitsfield – more details below. The City of Barre will create an inventory and conduct an analysis of energy resources, needs, and uses within Barre City while engaging residents in developing a plan and policies to meet the City’s energy goals. The Town of East Montpelier will draft regulations to address fluvial erosion hazard areas and river corridor encroachment and will engage residents in the process. The Town of Waitsfield will organize landowner associations for the construction and management of privately owned, shared, wastewater treatment projects in Waitsfield’s growth area. U.S. Housing and Urban Development and U.S. Department of Transportation have unveiled the Location Affordability Portal (LAP), a cost calculation tool that allows users to estimate housing and transportation costs for neighborhoods across the country. Housing affordability encompasses much more than the rent or mortgage payment and includes the impact of transportation costs on housing location choices. The LAP will help consumers and communities better understand the combined costs of housing and transportation associated with living in a specific region, street, or neighborhood and make better-informed decisions about where to live, work, and invest.